With its sprawling beaches and laid-back lifestyle, it’s no wonder Hawaiians are considered to be the happiest and healthiest. 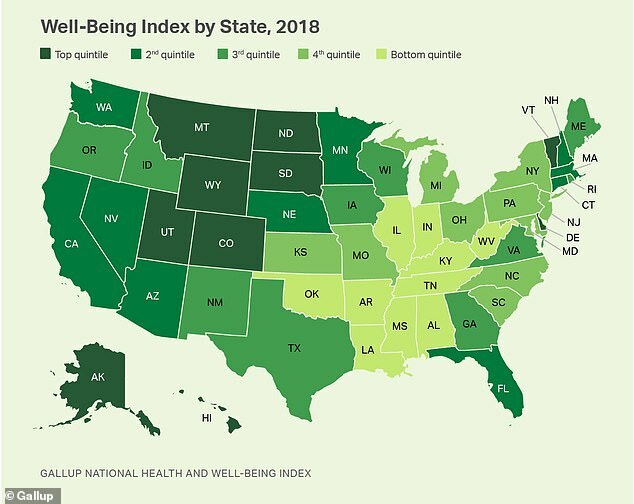 Hawaii has been named the US state with the best well-being, according to Gallup’s annual National Health and Well-Being Index. The Aloha State was followed by states that fell in the western US: Wyoming, Alaska, Montana and Utah. Meanwhile, high rates of obesity, smoking and depression led to West Virginia being named the unhappiest state. Rounding out the bottom five were all states that fell in the southern US: Arkansas, Kentucky, Mississippi and Tennessee. To reach its findings, Gallup conducted surveys across the US and asked adults how they felt about their careers, social life, finances, communities and physical health. After assessing each state’s provisions, the researchers provided grades out of 100. Hawaii earned a 64.6 out of 100 while West Virginia scored just 57.0 out of 100. The results were hardly a surprise seeing as Hawaii took the top spot for the seventh time since Gallup began its poll in 2008. In fact, across all the metrics that were measured, Hawaii was the only state to be in the top five for each one. Dan Witters, research director of the Gallup National Health and Well-Being Index, told TODAY that Hawaii didn’t just take the crown because of its tropical landscape. ‘So, while at first blush it seems intuitive – “Of course, it’s Hawaii” – the way that we measure well-being doesn’t necessarily give Hawaii a leg up on the other states just as a function of where it’s located and the year-round outdoor weather,’ he said. Good physical well-being seems obvious in Hawaii. The state has the third lowest adult obesity rate in the nation and has a lower smoking rate than the national average. In fact, Hawaii has some of the strictest smoking laws in the country and was the first state to raise the minimum smoking age to 21 in 2016. A recent bill introduced earlier this month would make it the first state to ban cigarette sales. However, Witters said Hawaii also benefits from a strong social well-being, including enjoying time with loved ones, being happy with career and being able to live within financial means. Witters said this is the high rates of depression, smoking and obesity are ‘the same story that we’ve seen in the past’. When it comes to depression, past reports have found that the Mountain State’s suicide and depression rates are among the highest in the country, with low rates of health insurance and access to mental health professionals. Last year, the State of Obesity report found that West Virginia led the nation in obesity rates at 38.1 percent. In addition to having the highest obesity prevalence, West Virginia also led the nation in the percentage of adults with diabetes at 15.2, according to data from the Centers for Disease Control and Prevention. ‘Your eyeballs just about fall out of their sockets when you look at the diabetes number,’ Witters told TODAY. He also noted that it’s the state where residents complain of high amounts of physical pain. This is likely why, in 2016, West Virginia had the highest rate of opioid-related overdose deaths in US – around 43.4 deaths per 100,000, according to the National Institute on Drug Abuse.